Today’s Lesson: To a coworker or a subordinate, the little things often matter most. 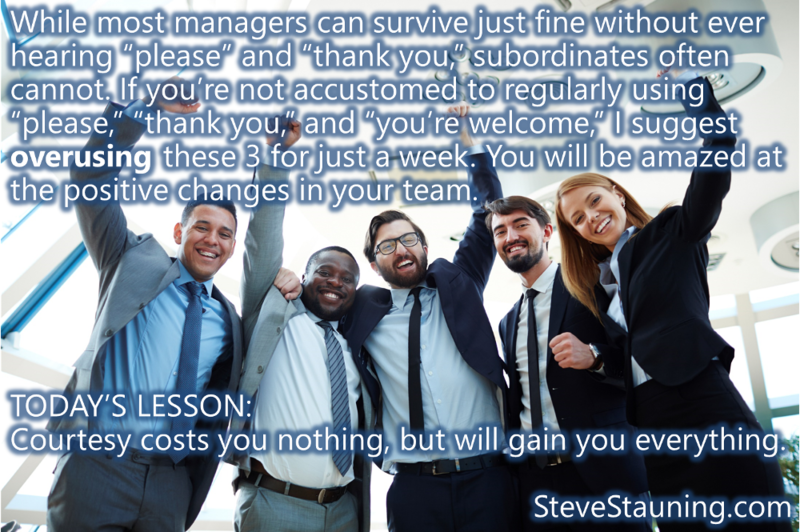 While most managers can survive just fine without ever hearing “please” and “thank you,” subordinates often cannot. If you’re not accustomed to regularly using “please,” “thank you,” and “you’re welcome,” I suggest overusing these 3 for just a week. You will be amazed at the positive changes in your team. Courtesy costs you nothing, but will gain you everything. First, I have to say that I hate you! 🙂 I was so ready to dismiss this “meme” as a bunch of crap. PSychobabble advice that wouldn’t change a thing, but then I tried the courtesy thing for a week – holy crap, it’s amazing! I cannot thank you enough!!!! I’ve got a team of 22 and their attitudes and productivity literally changed before my eyes!!!!!!! WOW – AMAZING! Very Kool to hear, Karl with a K! In all seriousness, I was also amazed at how quickly my team changed when I first started using these little niceties. It’s crazy how much the little things matter. Glad I could help.